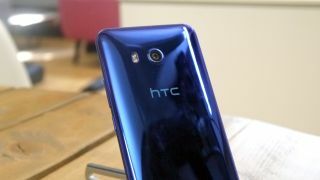 It seems that HTC may have hidden its upcoming flagship – currently known as the HTC U12 – in plain sight recently, but if so it clearly didn’t do a good enough job. HTC brought a few handsets to a 5G Industry Alliance event in Taiwan, including an unknown device with stickers obscuring many of the details, but which was caught on camera by Sogi.com.tw. What those stickers couldn’t hide is the super-widescreen, likely 18:9 aspect ratio of the display – a feature that’s common on recent flagships like the Samsung Galaxy S8, but not found on the HTC U11. The phone also doesn’t appear to have a fingerprint scanner on the front, so it’s probably on the back, unless it’s been dropped altogether. Now, while this device may not be the HTC U12, it looks to be high-end, and reputable leaker Evan Blass claims that it “apparently” is the U12. It also lines up with an earlier leaked render, so there’s a good chance he’s right. Whatever the case, we’re expecting to get an official look at the HTC U12 soon, but not quite as soon as you might expect, as it’s unlikely to land at this month’s MWC 2018, with rumors instead pointing to a March or April launch.